It’s time to decorate for the holidays!! Just in time, here is a collection of Christmas Decorations for your home! 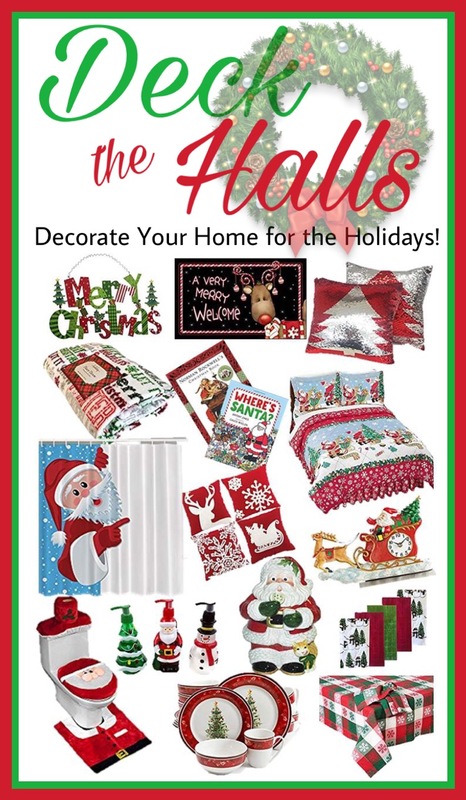 There is something for every room in the house – everything you need to Deck the Halls this holiday season! I hope you enjoy these fun finds! If you’d like to have any of the items featured here for your very own, you can click on the title or photos below and you’ll be directed to Amazon where you can make your purchase. Holiday Hand Soaps Trio. Christmas themed dispensers shaped like Santa Claus, Frosty the Snowman and a Christmas Tree. Each approx. 10 fluid oz Liquid Hand Soap Dispenser. I love pillows and throws for the holidays brings the festive right into our home quickly. Plus always wanted a set of Christmas Plates. Found you on Blogging Grandmothers link party. I’m not a big fan of Santa Claus, but I did love both lots of the cushions – very festive but still quite tasteful. I think my favorite is the throw. So cheerful and yet useful. Thank you for sharing with Blogging Grandmothers. I have shared on social media. « First Things First, Love Yourself!